Видео - техника нанесения татуировки, контуры и плотный закрас в цвете. В данном видео вы увидите процесс нанесения тату вблизи и с расстояния, макросьемка присутствует. На фоне ничего не рассказываю, так как нету особо смысла, технику нанесения нельзя описать и не получится, я например учился наносить только по видео. In this video tutorial, I explain how to work, and only show the tattoo technique drawing in the lines and in the dense paint the tattoo. Explain the application of the technique does not always make sense, you will easily see it as I was doing the tattoo, only video lessons. I hope you learn to make the best quality and the best tattoo in the world. 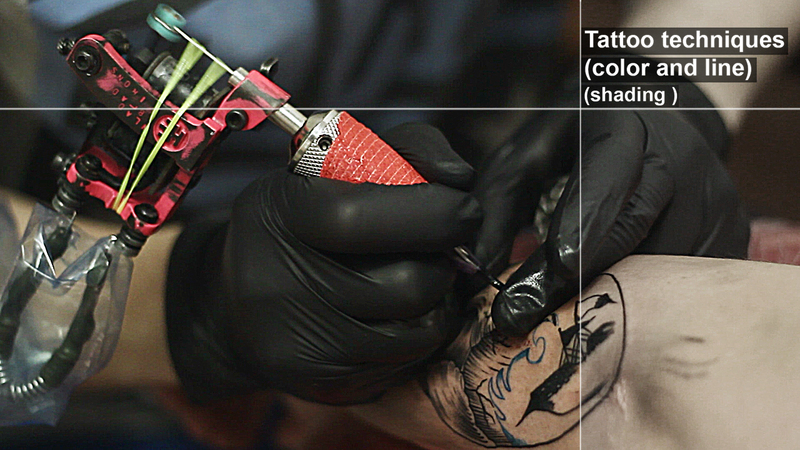 In this video tutorial, I used two tattoo machine for tattooing. Contouring machine and a machine for painting and drawing shadows in a tattoo. At first I put circuit, then the shadows, and then start to paint colors. All gradually. In this sketch, "a ship that is sinking into the sea," it took me only 4 colors: dark blue, green, white and turquoise. First applied dark shades, and then tattooing light colors. For the reflexes in the tattoo I used green shades at the bottom of the sketch. Needles used a 13 round mag and 7 Round liner. Leave your comments under the video with questions and I will try to answer each question, as well as leave your wishes for video filming and what better than a video shoot.